Every Autumn when I start spying lovely plump pears, plums and apples, thoughts of warming fruity goodies are not far behind. This particular little loaf I’m bringing you today has been a long time in the making. It first starting flitting about the corners of my mind a few years ago, when the aforementioned greedy Autumnal thoughts lead me to this delicious chocolate and pear cake. So this Autumn, finding my fruit bowl running over with many sweet little apples, I began hankering after something upside down-y involving apples. 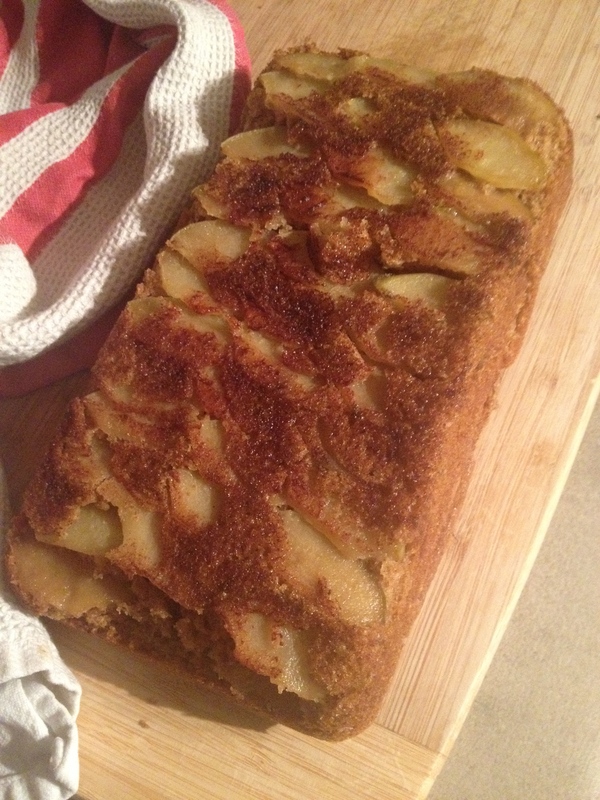 It has taken a little experimenting, but I am happy to settle on this combination of slightly spicy ginger loaf topped with apples. Upside down fruit-topped baking, I have concluded, needs a reasonably hefty cake to support it, and ginger loaf is up to the task. I used this ginger loaf recipe as a base with some tweaking of my own, including a little wholemeal flour to give it some extra muscle. And also because I love wholemeal flour. Butter your loaf tin. Peel your apple if you like, although I prefer mine with a little bit of skin. Quarter the apple and cut each quarter into thin slices. Mix the brown sugar and cinnamon together and sprinkle into the bottom of the loaf tin. Lay the apple slices in top of this mixture and set aside. Melt the butter and golden syrup together in a large saucepan. Add the egg and the sugar and mix in. Then add all the other dry ingredients except for the baking soda. Mix the baking soda into the milk and then add this to the mixture. Pour the ginger loaf mixture into the tin, on top of the apples. Bake for 50 – 55 minutes, until a skewer comes out clean. This may seem like a long time for a little loaf, but the fresh juicy apple slices make the mixture quite moist and mean the loaf needs longer to bake. Trust me, I have been faced with the sad, sucking noise of turning out under-cooked baking in earlier versions of this apple-topped cake, when I have had less patience with the length of baking time. Rest the loaf for a few minutes in its tin before running a knife around the edges and gently turning upside down. The apple keeps this loaf tasty and moist. It can be a little prone to breaking up, so you may like to use a spoon, particularly if you fancy this warm with some vanilla ice-cream. This, I can recommend.